A number of you reading this will probably be feeling a bit guilty, in fact may even be feeling a bit embarrassed. Let me explain why to those of you who were unavoidable detained on Saturday morning (for legitimate purposes). It was an away run from Otford (it had been some time coming and had been delayed for several reasons which are unimportant). It was set close to Hollybush for those that needed to run back for child duties at 9.15 am. I had gone to bed the night before having listen to the regular doomsday says on the telly about storm winds and lashing rain. I have regularly (in this very slot) extolled the virtue’s of Oaks Blokes Runners, men of Oak, made of sterner stuff etc etc. I woke to the promised lashing rain and thought, ‘they have got it right for once’ but the guys will still be there. Sure enough as I drove over to Otford I passed Duncan and his 7am start group on route back to Otford. 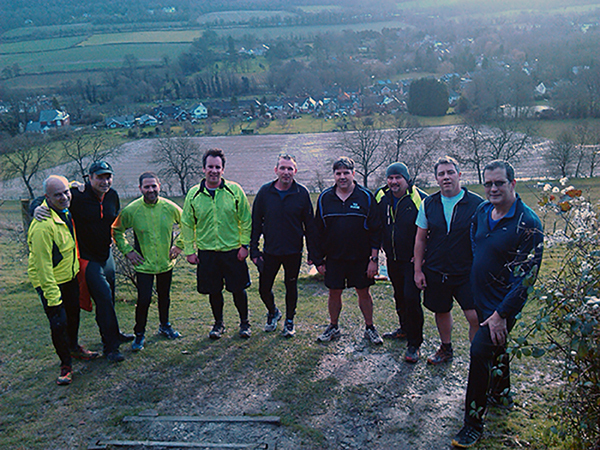 Seven of them at Seven, in this weather – tough guys !! I met them at Otford when they arrived, just as the rain stopped. 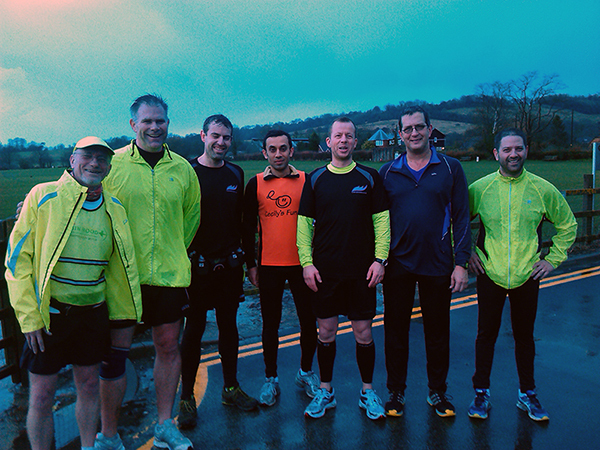 See photo attached, of rare seen Nigel P, Hammad (new) looking fresh and ready to start running (the trouble with younger guys, is they do show up us old ones), Graham O who is clearly going through a mid life running crisis, having run to the start at Otford from Sevenoaks, did the 7am run, then the 8am run and then ran home without coffee. A double run medal also goes to Dave R, Andy (still getting smaller every week) and of course Duncan. 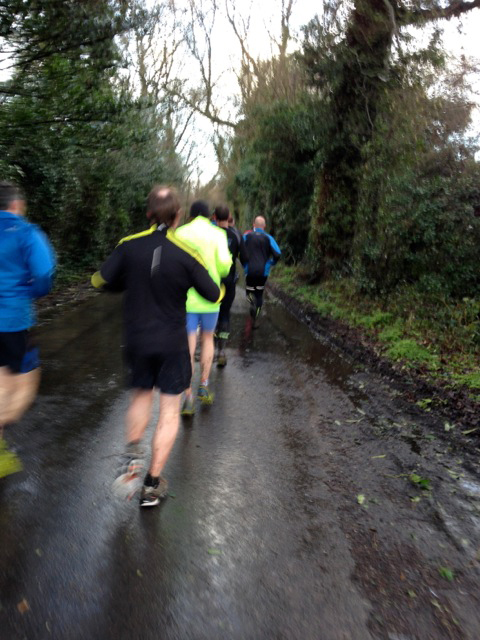 Now the main run was a little damp underfoot. In fact just running across Otford Rec felt like wading through a swamp on the way out. The on the way back having actually waded through swamps, it felt fairly solid underfoot. Duncan went one way with one half and I ran the other way with the rest. Lars and Colin did their own thing. 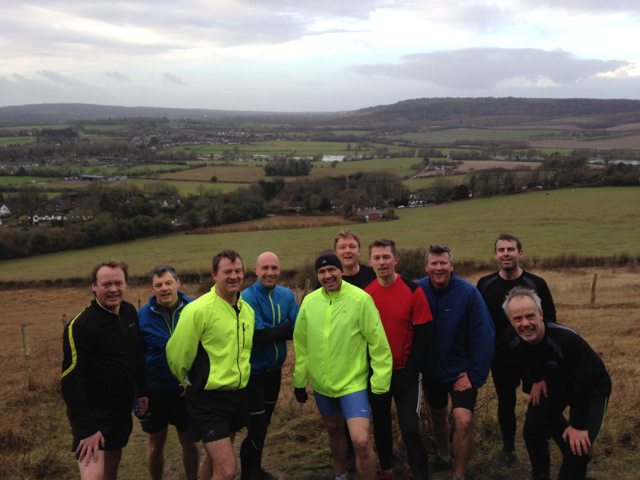 A couple of hills later, we joined up with Lars and Colin again near Shoreham Church. They were about to run back to Otford but I gave them some local advice about a dryer route (I lived there for over 10 years). He took my advice – See picture of Lars and Colin wading through the lake !!! Sorry guys.